Escape From Squidland is a cute family-friendly boardgame for two to four players. The Robinsons are in trouble! They made an emergency landing and parts of they spaceship have been scattered into the surrounding vicinity. No need to worry! Dad has a contingency plan! He organizes a little game and whomever gathers the six missing parts and return with the to the spaceship first wins! Let the race begin! 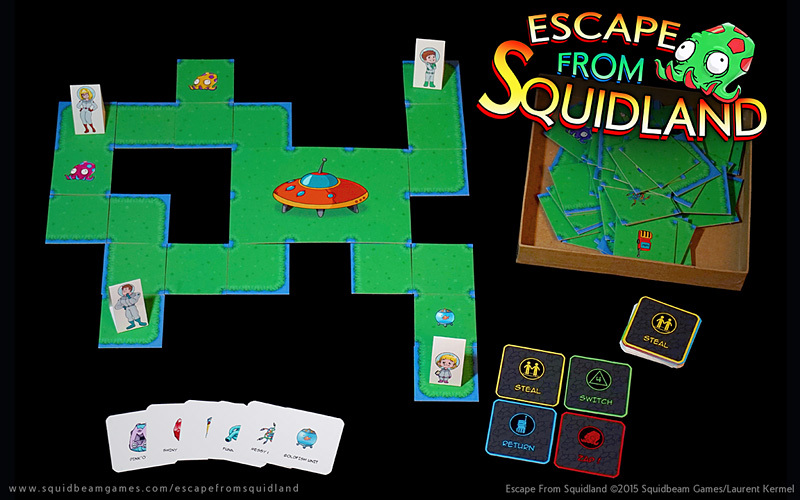 Escape From Squidland is a tile based boardgame. Each player takes turns and explores the surrounding area by laying tiles or walk on already revealed tiles if they wish to. So... where does Escape From Squidland come from? Back in the 1980s, and as a teenager, I used to design my own video games as well as my own board games. For me, video game and board game design are intertwined and I would really advised aspiring video game designers to try their gameplay mechanics ideas in cardboard form first. Games should provide good human interaction and evoke strong emotional responses, and board games allow you to test such interactions and see how your players respond to your design. Anyway, back to Escape From Squidland - it is based on a board game I designed in the mid-1980s. A few years ago, I got back into playing board games again and realized how popular tile-based games were, which motivated me to revive this old design of mine. The original game had a strong Dungeon & Dragon theme and had a lot more complicated rules, which I changed in order to create a game that would be more children and family friendly.